We will always remember Randi Cohen’s smiling face and her kindness toward everyone who had the good fortune of meeting her. Randi’s sudden passing in April 2018, was a shocking and sad event. As a lifelong animal lover, Randi became the driving force at NEAS. She often worked well past dinner time, just because she wanted to. She helped expand our Shelter’s national advocacy for rescuing homeless animals who were unwanted and under the threat of being euthanized. 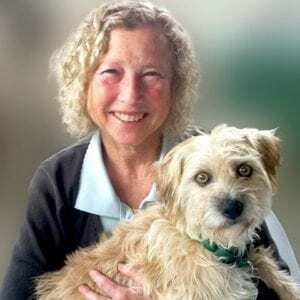 Under Randi’s leadership as Northeast Animal Shelter’s Executive Director, the number of homeless pets saved by the Shelter grew to over 133,000. Read on for messages of remembrance from friends like you. 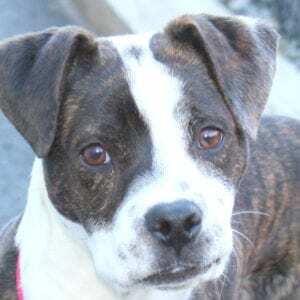 As a persuasive and impassioned advocate of helping homeless animals, Randi became the face of Northeast Animal Shelter. She was delighted when people she didn’t know would recognize her on the street after reading one of her carefully written fundraising appeals or seeing her on TV. Randi happily showed visitors around our Shelter, beaming with joy as she walked from room to room. She especially enjoyed showing children around and explaining to them how important it is to treat animals with love and compassion. Here’s how Randi’s community of friends described her. Jack and Dante are the classic “odd couple” – as different as night and day, but better for their differences in the end. They arrived around the same time, returned by their owners for various reasons. Jack originally came to us from Georgia, where he had been found on the side of the road near death. He was less than a pound … with maggots in his eyes and mouth. After having one eye removed, Jack was placed in foster care in Georgia, and when he was 15 weeks old he was transported to our Shelter. 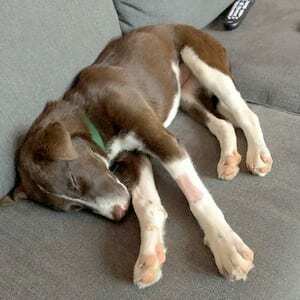 Our rescue partner knew a dog with only one eye would have a hard time finding a home in Georgia – where unwanted dogs and puppies are overabundant. 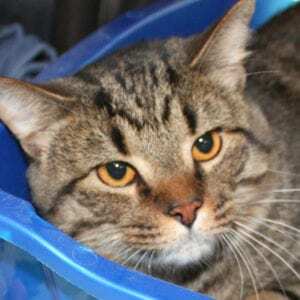 NEAS would offer Jack the best chance to find his forever home. Our Saving Homeless Pets Across America program makes life-saving rescues like this possible. In fact, Jack is one of thousands of homeless pets we save each year from across the country. After just five days at NEAS, Jack found a wonderful family who adored him. The only problem was, the family had cats, and Jack did not get along with them at all. The family worked with trainers hoping Jack would learn to co-exist with their cats, but it didn’t work out – and Jack was returned to us. Still, we weren’t convinced Jack’s dislike for cats couldn’t be resolved. As an experiment, we introduced Jack to a feisty cat named Dante, who we felt had the confidence not to be cowed by a 52-pound barking dog. It was no surprise that at first they “took” to each other like oil and water, yet we were undeterred. We knew that if we could train them together and get them to trust each other, it would be mutually beneficial. One of our amazing staff members brought Jack to a professional trainer, where he learned some basic commands, including “sit,” “stay,” “lay down,” and “leave it.” Over the course of three months, he learned to be patient and to follow directions, eventually becoming a real superstar student! Dante’s story is a little bit different. He was a local surrender – returned by his owner due to his unpredictable behavior. Sometimes he’d play nicely and other times he’d bite and scratch. We soon discovered it was a real catch-22 with Dante. He got over-stimulated but also needed activity. Fortunately, we discovered an interesting solution – we put Dante in a baby stroller so he could take in the sights and sounds all around him! We kept reintroducing Jack and Dante. The more time they spent together, the better they both did. They helped each other to control their initial tendencies toward aggressive behavior, becoming good friends in the process. 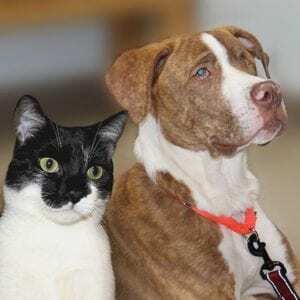 Eventually, Dante found his perfect match – and, after going on many field trips wearing his “adopt me” vest, Jack did as well. He even got a new name – Beric! Today, he is happy as can be, loving his new home and family (including his new canine brother). Thank you for making success stories like this possible! There are so many more we could share. Jack and Dante are only two of the many examples of special-needs pets who go on to lead happy, long lives because of your support. ● Pets with light skin and short or thin hair are particularly prone to sunburn. Apply a sunscreen specifically made for pets. ● Keep pets off unknown grassy areas, which can be treated with fertilizers and pesticides during the summer. ● Dehydration in dogs and cats is a real possibility during the summer. Give your pet plenty of water breaks in the shade. ● Don’t leave your pet in the car. On a sunny, 70-degree day, it can heat up to over 100 degrees within minutes! During the hot summer months, please help us keep all the homeless pets in our care cool, fed, safe, and loved. On any given day, we house between 100 and 200 pets. Often, we receive a large number of pets at one time – and our intake can be especially high during the summer. We need to keep our supplies well-stocked to handle these arrivals. Can you help us? Gift cards (we use these to buy food and supplies); unopened canned dog and cat food; cat litter; trash bags – these are just a few of the high-priority supplies we need most right now. Please visit our website for a full list of the items we gratefully accept, or search for our wish list on Amazon. And, when you shop at smile.amazon.com and select Northeast Animal Shelter as your favorite charity, Amazon sends us 0.5% of the purchase!